A major piece of border security legislation cleared another hurdle in the Texas Legislature on Tuesday, prompting lawmakers to predict that a compromise between the House and Senate will be hashed out before the session ends June 1. With a key piece of border-security legislation advancing in the Legislature Tuesday, lawmakers are predicting the Texas House and Senate will be able to strike a compromise on competing plans to beef up the state's border presence before the session ends June 1. A Senate subcommittee voted out House Bill 11 by state Rep. Dennis Bonnen, R-Angleton. It would, among other things, increase the number of Texas Department of Public Safety officers on the border, establish an intelligence center in Hidalgo County to analyze border crime data and create a reserve corps of retired DPS officers to increase the agency’s ranks. The adopted version also strikes language included in the Senate border bill that would mandate the continued presence of the Texas National Guard on the border beyond its current deployment. Border security bills are considered priority legislation after Gov. Greg Abbott declared it an emergency item in January. But the measures remained in gridlock until last week, when Bonnen’s bill was scheduled for a hearing before the Senate's Veteran Affairs and Military Installations Subcommittee on Border Security after idling for months. On Tuesday, chamber leaders indicated they were close to a deal and a final version could be presented to lawmakers soon. 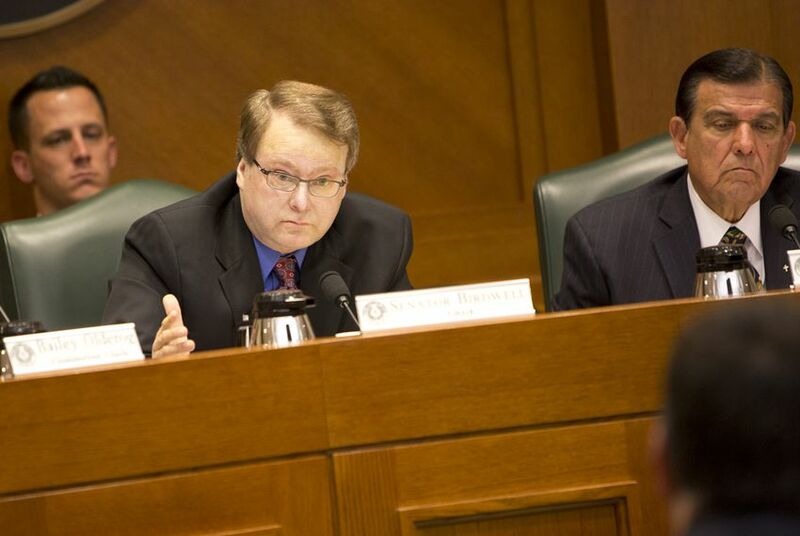 A side-by-side analysis of the two measures provided by Birdwell's office indicates that lawmakers took from both Senate and House versions to craft the final package. The latest draft includes language from the House bill that facilitates DPS’s hiring of veterans that left the armed forces in good standing. The reserve officers’ corps was also a provision included in the original House proposal. The new draft adopts a previous Senate bill measure that creates a transnational gang and organized crime division of the Texas Attorney General. Other measures were included as new provisions, including one that allows the Texas DPS to establish southbound checkpoints on international bridges in tandem with the Department of Homeland Security’s Customs and Border Protection. The latest version also includes a provision that allows Department of Public Safety officers across the state to work 10-hour shifts. That’s compared with the original House bill, where that scheduling option was only available for border agents. That option is contingent on whether budget writers appropriate enough money for the 50-hour workweek, because it comes at a cost of about $200 million. Bonnen, who has been critical of the Senate leaders for letting his bill sit, expressed the same optimism that the bill won’t need to go to a conference committee to iron out changes. “I think very positive talks are happening on border security and they’re also coming together on the budget on it,” he said. Critics of the measure expressed concerns over a section of the final bill that strengthens the penalties for human smuggling if a person illegally and knowingly transports someone for profit. Representatives from the ACLU and the Mexican American Legal Defense and Educational Fund said that provision could prompt a lawsuit because existing federal laws already address those issues. Both Birdwell and Bonnen said that part of the legislation was thoroughly vetted and don’t think it will slow the legislation. The bill could be voted out of the full Senate Veteran Affairs and Military Installations Committee by Wednesday.